SRDC relies on the generosity of corporations, institutions, and foundations to support its operating budget. These stakeholder contributions are vital for supporting essential operations tasks like trail maintenance, staffing events, and paying for our lean and mean team of staff and contractors who are working to expand and improve Schuylkill Banks. 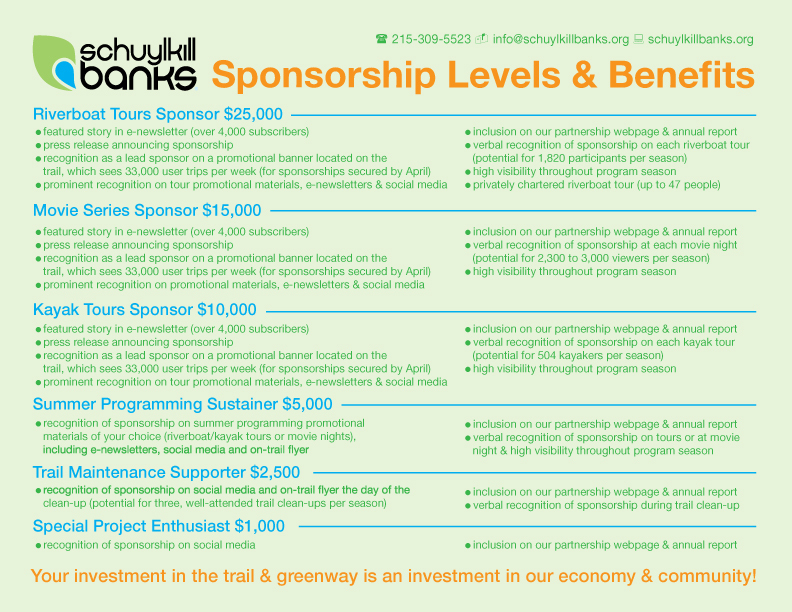 Sponsorships are also available for Schuylkill Banks events, including Riverboat and Kayak Tours. Please call 215-309-5523 x100 or email [email protected] for more information about becoming a Schuylkill Banks Stakeholder or Event Sponsor. Your investment in the trail & greenway is an investment in our economy & community!